is ideal for cooling an area of up to 400 square feet. Many of these units also include either a supplemental Heat Pump or electric heater which depending on its rated heating capacity, can also heat your application space. 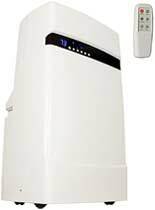 12000 BTU’s is the industry standard for portable air conditioners and offers the widest varieties and models to choose from. It's important to consider various features when choosing your portable AC such as: Nanomist – self evaporative technologies, as well as air purifier functions such as: IONIZER – HEPA – 3M filtrete filters etc.